Can the farmer cope with risk? 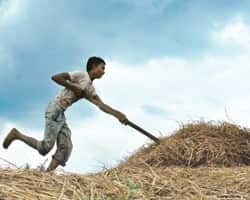 The Reserve Bank of India’s annual report, released recently, has emphasized the need to accelerate growth in agriculture, especially food crops, against the backdrop of hardening trends in global food prices and the importance of agriculture in poverty alleviation and controlling inflationary pressures. One serious impediment here is the lack of effective risk mitigating tools in the hands of Indian farmers. The need of the hour is to have an effective and integrated insurance product, which would not only take care of the insurance needs of the crop, but also cover the life, health as well as non-life assets of farmers. The most prominent insurance product available at present is crop insurance, provided through the National Agriculture Insurance Scheme. This is available for all farmers, including sharecroppers and tenant farmers, irrespective of their size of holding. It is tied to crop loans given by banks and is compulsory for loanee farmers. A large number of crops including coarse crops, cereals, oilseeds and cash crops such as sugar cane, potato, cotton, etc., are covered. The premia rates vary from 1.5% to 4% of sum insured. For annual commercial/horticultural crops, the premium is based on actuarial rates. Small and marginal farmers get a subsidy on the premium they pay. The state and Union governments share the premium subsidy burden. However, there are several deficiencies. First, subscription is largely restricted to farmers who take crop loans. This limits the coverage of the scheme—evident in the fact that only about 15% of the country’s farmers have been covered by insurance so far. Third, there is long delay, often more than a year, in payment of claims to farmers due to the time-consuming crop-cutting experiments by the agriculture department and the delay in receipt of subsidy from the state and Union governments. Thus there’s hardly any help for smoothing income fluctuations of affected farmers. Fourth, the benefits of the scheme are highly skewed. One state, i.e., Gujarat, alone accounts for more than 50% of claims settled and premium subsidy benefits are highly tilted in favour of large farmers having irrigated land rather than small, rain-fed farmers. Further, the claim premium ratio is unsustainably high at about 270%. During kharif 2006, the total premium collected was Rs467 crore but claims worth about Rs1,260 crore were settled. In all this, it is clear that the ability of the scheme to provide relief to farmers in the event of crop loss is very limited. A Union government committee set up in 2005 to examine the issues suggested that the village should be the unit for settlement of insurance claims rather than the block, as is done at present. This would improve implementation. The panel also suggested “on account" payment of claims to farmers, which would mean half of the likely compensation can be paid in advance, subject to adjustment in final payment. These suggestions need to be implemented at the earliest. In most developed countries, farm insurance schemes are subsidized by the government. In the US, crop insurance is subsidized by the state but implemented by private insurance companies. In Canada, crop insurance is implemented, with state support, using the area approach, similar to that of India. In both these countries, crop insurance is linked with institutional credit. In contrast, in Japan the government spends a large amount on subsidizing farm insurance but this is not linked with credit. It also conducts the business of reinsurance for the smooth implementation of farm insurance. There is a strong case for continued state support for farm insurance in India, as about 80% of the land holding is less than 2ha, farmers have poor access to credit and their investment capacity for crop production is limited. But, state support has to be efficiently handled. A scheme for the poor need not be poorly implemented! The Insurance Regulatory and Development Authority has promulgated Micro-Insurance Regulations, 2005, lowering the minimum share capital requirement for insurance companies and paving the way for a new band of micro-insurance agents who will undergo 25 hours of training, instead of the currently mandated 100 hours. This is expected to encourage more small players to explore the insurance market, and the outreach could then expand substantially among small farmers. A long-term approach to rural and farm insurance with customized, flexible and integrated risk products is required to incentivize small and marginal farmers to undertake risks. Micro-insurance offers immense potential. A new integrated micro-insurance product to cover life, health and non-life assets of small and marginal farmers at reasonable costs could be developed and a group premia approach on a village-wise or panchayat-wise basis would help increase insurance penetration.